The City of Prairie View, Texas is proud to receive its Sister City, International Guachené, Cauca, Colombia. Honoring with his presence is the Senator of the Republic of Colombia, Dr. Edinson Delgado and his wife, Cauca Health Department Director, Dr. Luz Nidia Martinez Oliveros, Dr. Francisco Paz Zapata, Mayor of the City of Guachené and his wife, Ximena Bastidas Cabrera, City of Guachené Social Director and Attorney, Mr. Eliecer Ibarguen, Industrial Relations Director of the City of Guachené, Yescenia Perea, Institutional Relations Director, Antonio Jose Camacho University. This visit is the follow-up to the agreement signed in June 2013 to carrying out activities of benefit to both sister cities. 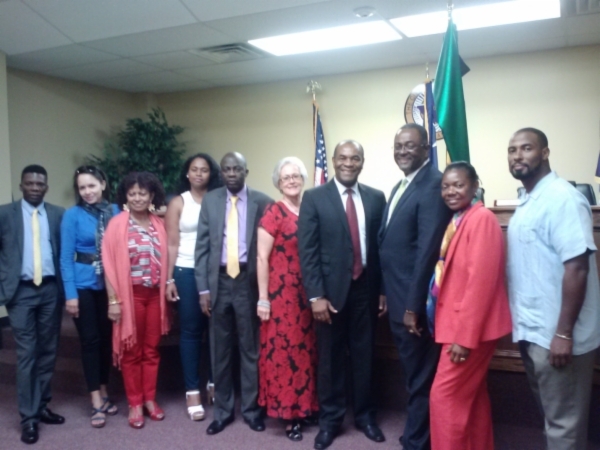 Mr. Frank D. Jackson, Mayor of the City of Prairie View, and his wife, Waller County Judge, Marian Elaine Jackson, Bryan Rowland, City Council and First Vice President of Prairie View Chamber of Commerce, Mrs. Shelytha Alexander-Simmons, Municipal Judge, and Amparo Isaza-Navarrete, Sister City International Coordinator for the Cities of Prairie View and Hempstead and Recruitment Coordinator for the Brailsford College of Arts & Science at Prairie View A&M University, all met to discuss an action plan for immediate implementation at the cities of Prairie View and Hempstead, Texas and Guachené, Cauca Colombia. Senator Edinson Delgado of the Republic of Colombia on his visit to the city of Prairie View, Texas mentioned that one of its priorities is to ensure that the young people of low financial resources of Colombia obtain a high-quality education, as this is the polo of personal development, family of their community and the country. This is why he is visiting, to support the mayor of Guachené and other leaders of Northern Cauca and of Buenaventura in developing a firm commitment among the sister cities of Prairie View, Hempstead and Guachené, and take advantage of the potential for growth and technology.